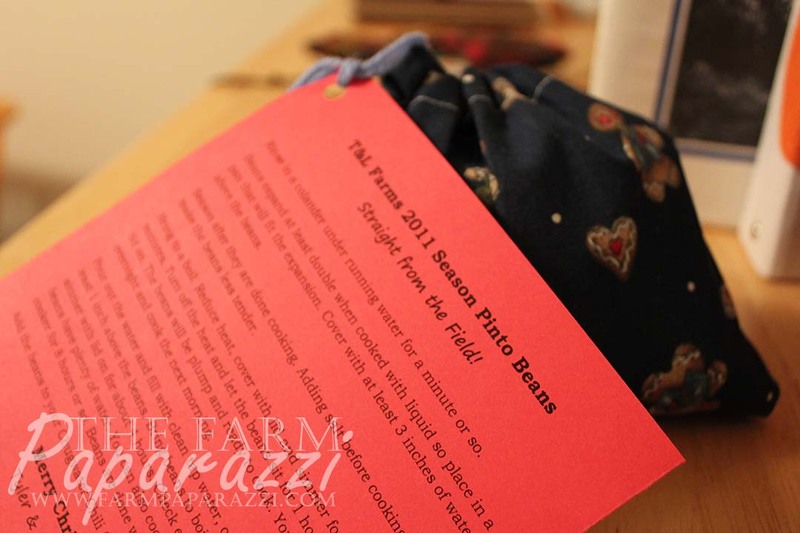 Okay, so I know Christmas is over, but I was organizing some photos on my hard drive and ran across these gift bags I made several years ago. They are too cute, easy and inexpensive not to share! So, maybe it’ll inspire you for Christmas gifts next year, or maybe you can make some for birthdays and thank you gifts throughout the year. To be fair, I have easy access to both major ingredients in these gift bags. 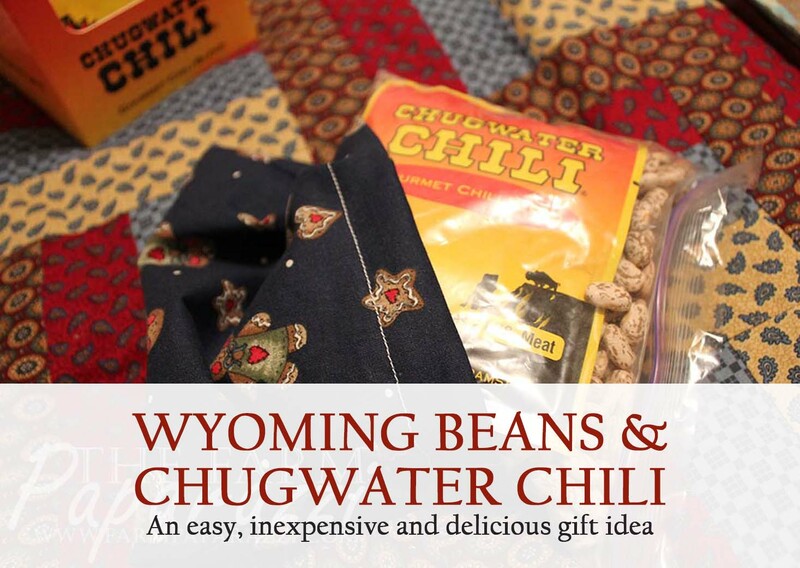 A) We raise pinto beans on our farm and B) Chugwater Chili is based just 30 miles south of us in, well, Chugwater, Wyo. However, you can obtain the dry beans at any supermarket (or check with a local farmer!) and you can find Chugwater Chili in many stores or order online at www.ChugwaterChili.com. 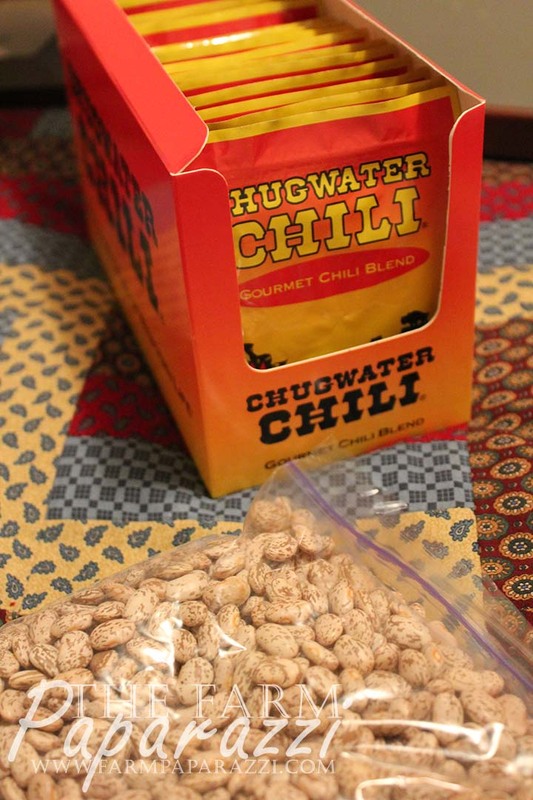 Trust me, Chugwater Chili is the best! And I’m not just saying that because my Grandparents were co-founders of the company. 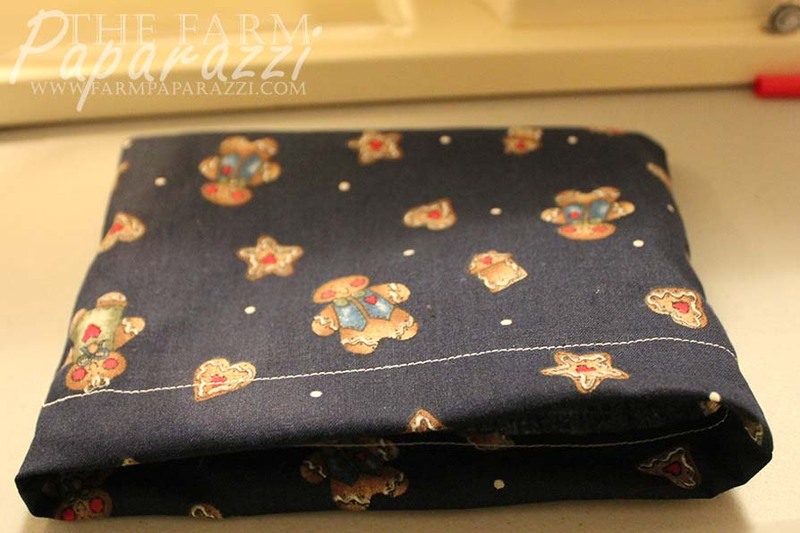 Start by making the fabric bags. Cut a piece of fabric to a suitable size. Make sure to calculate for seam allowance on the width. Make it double the length you want to end up with plus about an inch for the drawstring pocket. 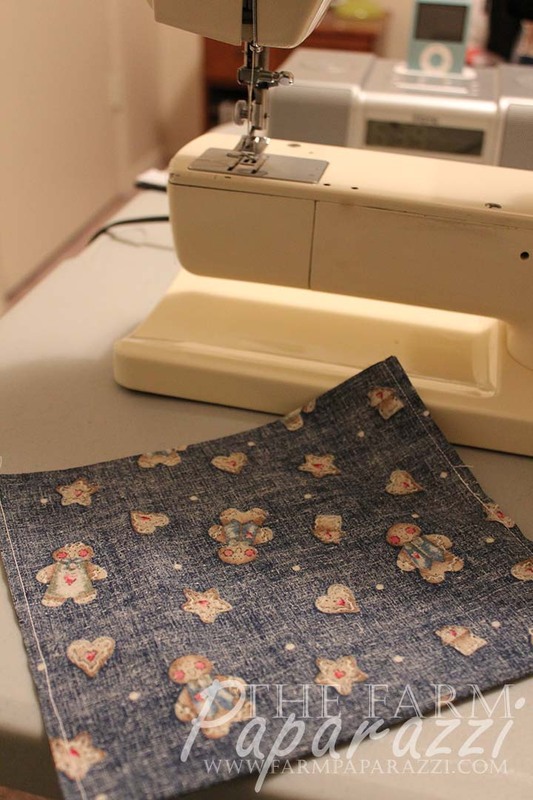 Fold right sides together and sew along both long edges. The fold on the bottom saves you from sewing another seam. Leave the top end open. 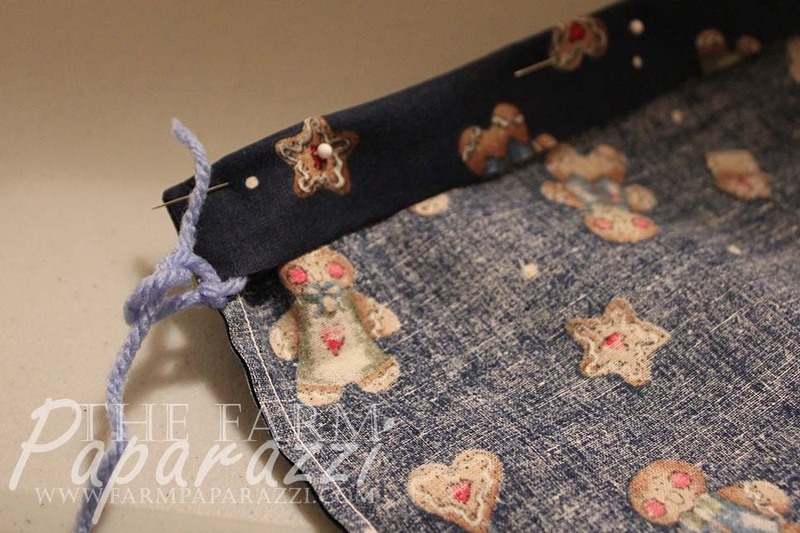 Then cut a piece of yarn or ribbon so it’s long enough to loop around the bag to create a draw string. Fold the top end of the fabric over and tuck the yarn underneath. Pin so the yarn stays above where you’ll sew (you want it to be able to move later, so don’t sew it down). Keep the two ends of the yarn showing outside the folded end and tie a knot so the two ends stay together. 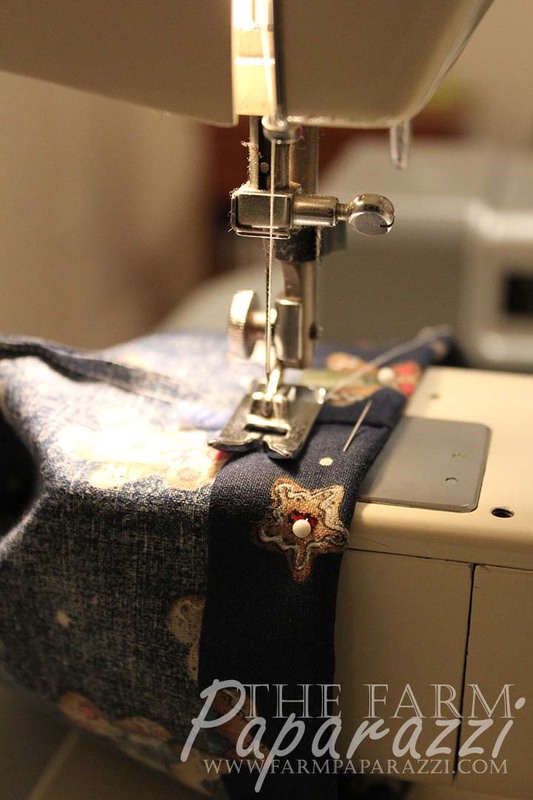 Starting at the end where you’ve tied your knot, sew a seam all the way around. 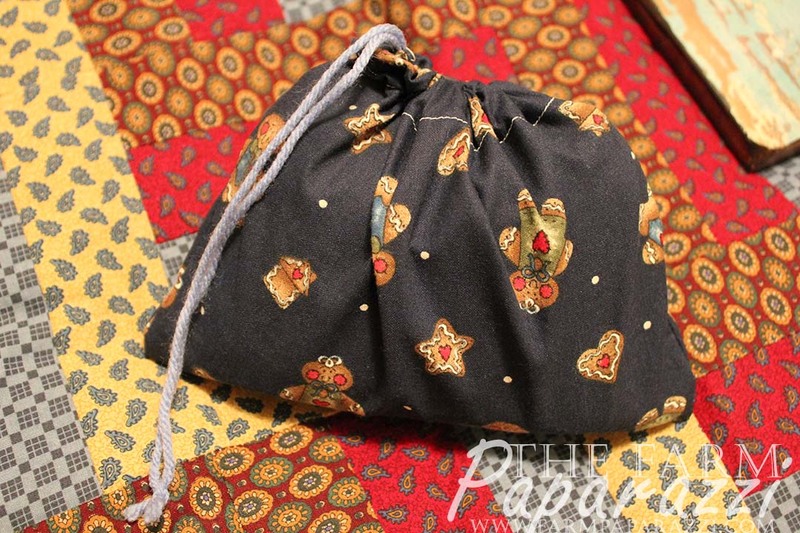 You’re creating a pocket to hold the yarn, while leaving the top of the bag still open. Leave a little space on the end so the yarn can still move freely, and again, make sure you don’t sew over the yarn. Pull out your pins and turn the bag inside out. You should probably use a thread that more closely matches your fabric. Don’t be like me. Next put the beans and chili together. Fill small plastic bags with about 1 1/2 cups of dry pinto beans. If you’re using beans straight out of the field like I do, make sure to sort them first. You don’t need to rinse them, but make sure you tell your gift recipient to rinse them before cooking. Tuck a 1 oz. 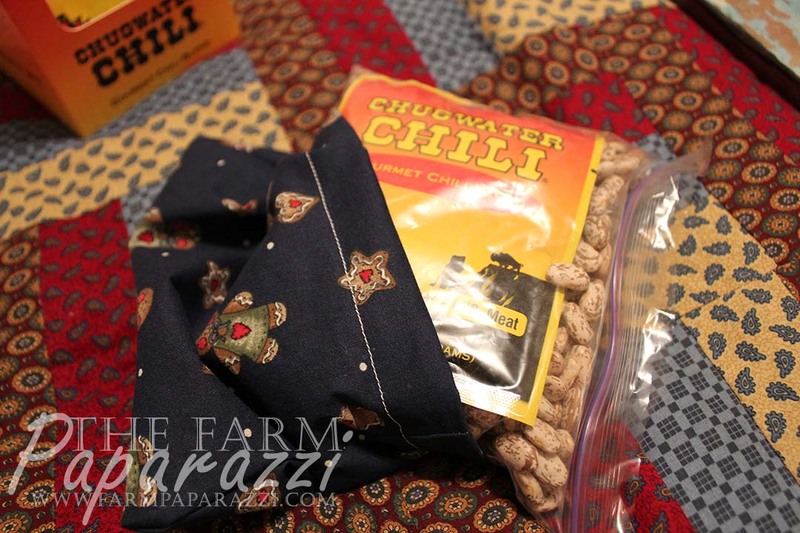 packet of Chugwater Chili in the plastic bag with the beans. The chili packet has enough seasoning for one batch of chili and the beans should be enough for the recipe (beans expand to about 2-3 times their original size when cooked). Tuck your yummy treat into the fabric bag. Pull the draw string and, voila! You have a fun, homemade gift. When I made these, I also included instructions for rinsing and cooking them. The chili recipe is on the back of the packet, so no need to repeat that. Do you have some creative magic you want to share? Be sure to link to it in the comments below. It is my paternal Grandma Rozella’s Belvedere Adler from the 1970s. She died when I was just a toddler and my mom ended up with it. So when I started quilting, my mom gave it to me. I love having a piece of her with me when I sew!